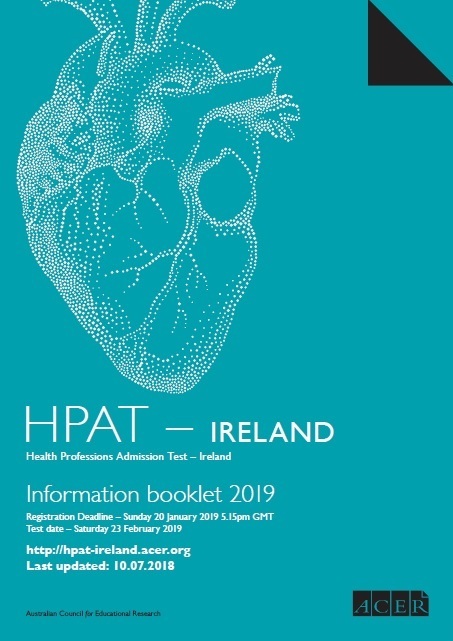 Below are references to journal articles about admissions testing and HPAT – Ireland. Dennehy, T., Kelly, M., & O’Flynn, S. (2013). General practitioners’ perspectives on revised entry and selection methods to medicine and the HPAT. Med Teach, 106(4), 113-115. Halpenny, D., Cadoo, K., Halpenny, M., Burke, J., & Torreggiani, W.C. (2010). The health professions admission test (HPAT) score and leaving certificate results can independently predict academic performance in medical school: Do we need both tests? Irish Medical Journal, 103(10). 1-3. Hill, A.D.K., Quinn, A. (2010). Author’s response – HPAT. Irish Medical Journal, 103(8). O’Flynn, S., Fitzgerald, T., & Mills, A. (2013). Entry to medical school – the gender question. What has happened? Irish Medical Journal, 106(8), 230-2. Quinn, A., Corrigan, M.A., Hill, A.D.K., Broderick, J., & McEntee, G. (2010). A comparison of performances of consultant surgeons, NCHDs and medical students in a modified HPAT examination. Irish Medical Journal, I03(6). Stevens, L., Kelly, M.E., Hennessy, M., Dunne, F. & O’Flynn, S. (2014). Medical students’ views on selection tools for medical school – a mixed methods study. Irish Medical Journal, 107(8), 229-31. Thakore, H. (2009). Medical education in Ireland. Medical Teacher, 31(8), 696-700.